Courtesy of Kambuja Trading Co.
A few dishes from the first Noodle.Maple.Social. Nite Yun came up with Noodle.Maple.Social as a way to show people that Cambodian culture isn’t just Pol Pot and the temples at Angkor Wat — that it’s also rollicking psychedelic rock, good times, and plenty of delicious food. This time around, the event will take place at Spice Monkey (1628 Webster St.), a Cambodian-owned restaurant in downtown Oakland. Yun, who also runs a pop-up dinner series called Nyum Bai, has put together an a la carte menu that highlights the Cambodian-grown Kampot peppercorn — arguably the world’s best pepper. Highlights include Kampot peppercorn fried chicken wings, several noodle dishes, and a version of koh, or braised pork belly, that also features the peppercorn. In honor of California’s great Cambodian-owned doughnut shops, there will be maple-glazed doughnut holes for dessert. 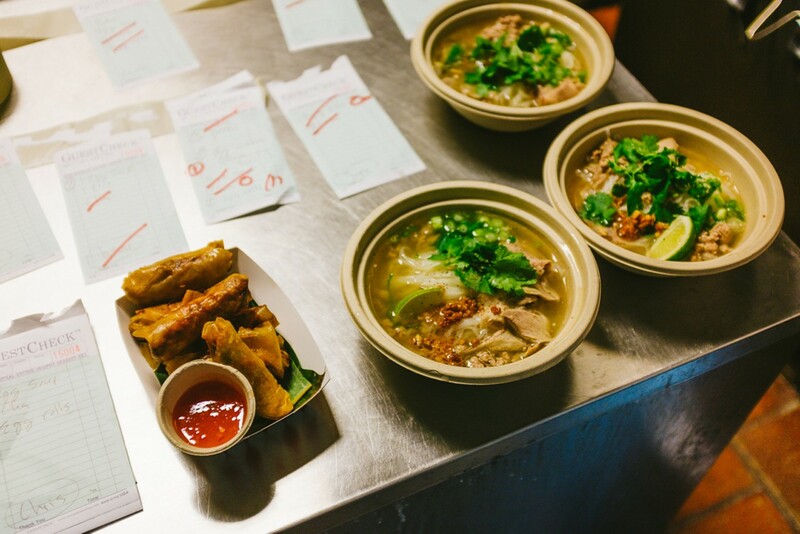 As was the case at the previous Noodle.Maple.Social pop-up, event co-organizer Kambuja Trading Co., which sells fair-wage scarves and bags made by Cambodian artisans, will have an array of products available for purchase.